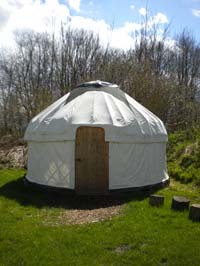 Here at The Sustainability Centre we have a variety of yurts. They have wood-burning stoves and can sleep up to 6 people. Prices are very reasonable and a night or two here will leave you yearning for a simpler existence living closer to nature. For thousands of years, yurts have been used from Turkey to Mongolia as sturdy portable homes for nomadic families who move from season to season to find grass for their animals. 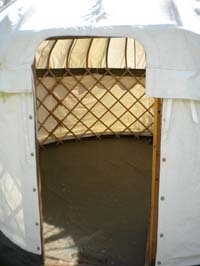 The yurt is made from a folding frame of curved wooden battens and an outer covering of felt and canvas. This makes it very strong, and it's both warm in the winter and cool in the summer. Its structure can stand up to immense winds, yet can also be packed down small enough to carry on the back of a horse, or inside a van. Yurts started appearing in Europe about 15-20 years ago and are now becoming very popular here as alternative camping spaces and transportable homes. They are very well suited to the changeable British climate and make a comfortable, low-impact and easily moveable home. The yurts tucked down at the far end of the campsite provide staff and volunteer accommodation. They are great examples of off-grid, low-tech living spaces. They range from 15 - 23 feet in diameter and are mostly made from steam-bent ash wood. This timber comes from sustainably managed local woodlands. The yurts are all heated with wood-burning stoves and use small solar photovoltaic panels to provide a modest but sufficient electricity supply.